Whether you're crossing state lines to squeeze in a trip home with the family this holiday season, or planning on hopping from continent to continent for an epic vacation with your friends, you'll want to be well-prepared for any mode of travel you're taking. Kill two (or um, 15) birds with one stone with the BauBax Sweatshirt. This cold-weather clothing will not only keep you comfortable as you're moving from planes to automobiles, 15 convenient features keep you organized as you go. It's basically like having a carry-on and sweater (or if you're into different styles: a blazer, or windbreaker, or bomber) all in one. BauBax outerwear is designed for avid travelers, people who hate to pack and/or dig through their bags for their most-needed items. All the styles of outerwear feature 15 design elements meant to get you through security and on that plane, train or car with style and ease. 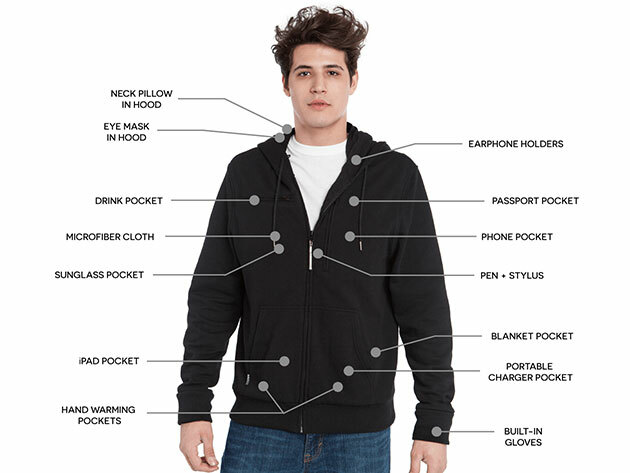 This is one of the most crowdfunded apparel items ever, with more than $9M raised on Kickstarter and $11M on IndieGOGO, and for good reason. Just check out all the features: for long layovers, red-eyes or those times when the passenger next to you won't shut off the light, the sweater features an eye mask and inflatable neck pillow. The neck pillow hides inside the detachable hood and inflates in a lightning fast two seconds. To deflate it? Just press it once and you're ready to go. Basically, every single comfort you've ever wished you had while traveling exists in this sweater. Cold hands from chilly terminals? Warm them up with built-in gloves. Earbuds always getting tangled up when you're trying to leave your seat? Keep them tucked away until you're ready for them with these earphone holders. You can even save precious space with the Koozie drink pocket — it'll keep your tray free for your laptop, and keep cold drinks cold and hot drinks warm. It's also perfect if you plan on wearing this sweater during your next ski/snowboarding trip to stay hydrated. Plus, you'll be able to easily navigate your way through those security checkpoints with devices thanks to this 10-inch pocket, perfect for iPads or any full-sized tablet. Need to sign for something? The zipper also works as a telescoping pen. And of course, there's a smartphone pocket to ensure your mobile device stays close by, but out of the way (and secure — instead of slipping out of your pants pocket). Because you'll definitely need your passport and ID safe and ready to flash, this chest pocket helps securely stow them away until you need them. Heading straight to a fancy Thanksgiving dinner? Be ready to impress straight off the plane with the blazer — the hood detaches, so you're looking sharp from the get-go. Those are just a few of BauxBax's amazing features — not only do they put all other "travel-ready" gear to shame, it practically replaces your carry-on. Usually, the BauBax Men's Sweatshirt is $200, but you can get it now for $109.99, or 45% off the usual MSRP.